The Warlords: Crystals of Power Slot is a post-apocalyptic fantasy world. Three warlords battle it out for glory. The Samurai, Priestess and Barbarian each have their own style of warfare. We benefit when they clash – in cash, excitement and dreams. 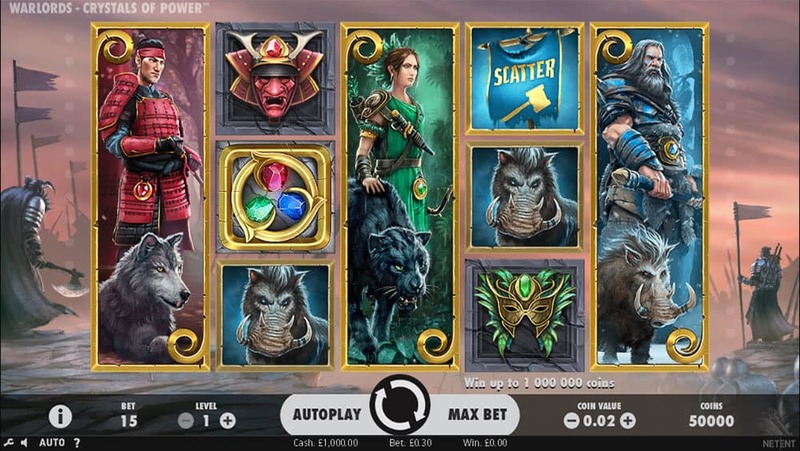 Award-winning Swedish slots studio NetEnt utilises every inch of its game design development skills to deliver a superb online slot that grips us by the lapels and takes us for the post-apocalypse ride of a lifetime. 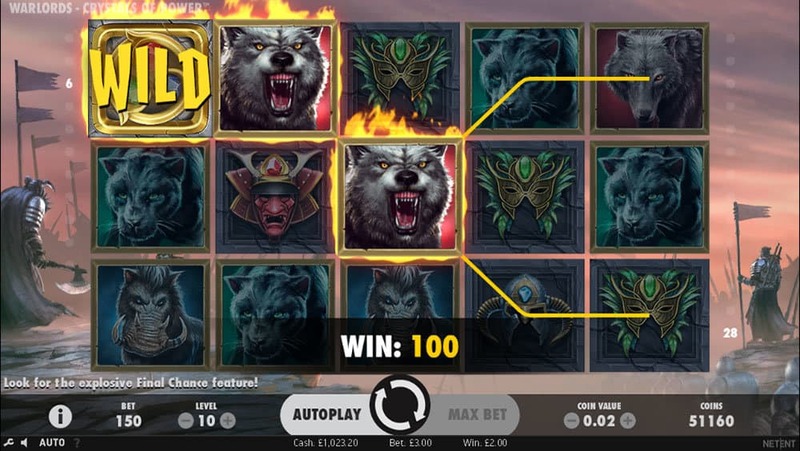 NetEnt takes its love of superb intros to the next level in its Warlords: Crystals of Power slot. As a Wolf pads through the Samurai’s ornate corridor to bring him the red crystal of power, we could be watching an apocalyptic blockbuster. Graphics in-game are also top-notch. The reel case sits in front of a windswept battlefield, while the game symbols animate superbly in winning combos. Our three Warlords appear as stacked symbols, each one staring solemnly out across the battlefield amidst a variety of dystopian weather. It’s atmospheric, it’s gritty, it’s superbly finished off. Landing a trio or more of the stacked Warlords isn’t easy, but when it happens it’s bountiful and wild. Speaking of which, the trio of crystals is our Wild symbol, substituting for all symbols except Scatters and bringing to life non-winning combos in the process. On any spin the Warlords can bring their own weapons to bear on the action with the Random Overlay Wild feature. Now, the Barbarian’s hammer, the Priestesses arrows and the Samurai’s sword can smash, stab and slash Wilds across the reels. But the real battles commence when two or more Scatters land on the reels. The Warlords then do battle, and if we finish with three or more Scatters on our reels we will launch either Warlord’s bonus feature. 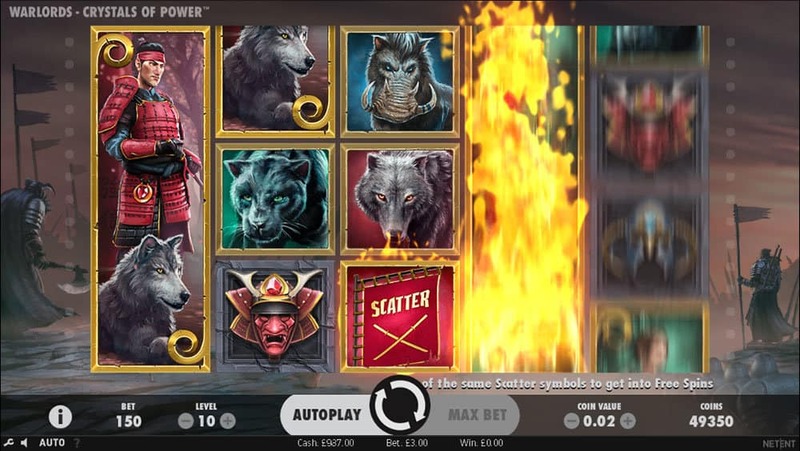 The Barbarian Free Spins delivers 9 free spins with extras added for every additional Scatter. The Priestess Free Spins gives us 7 free spins with added multipliers - potentially an incredible 6,666 times our stake to be won. 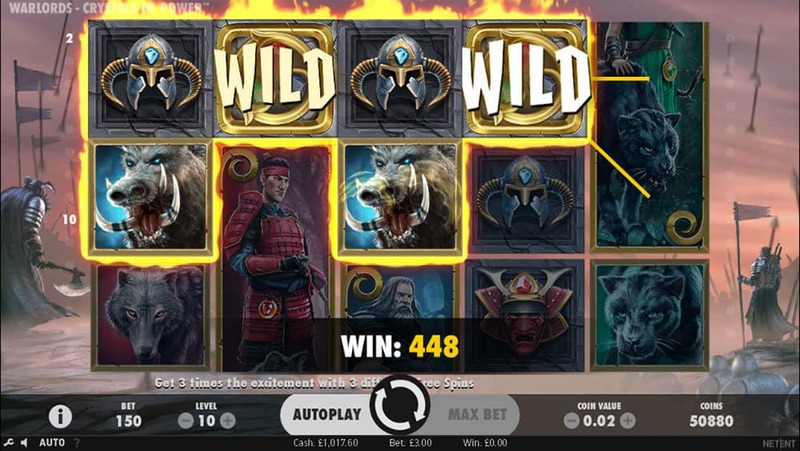 Finally, the Samurai Free Spins delivers 5 free spins, but with Sticky Wilds added for every Scatter that remain for the duration of the bonus feature. 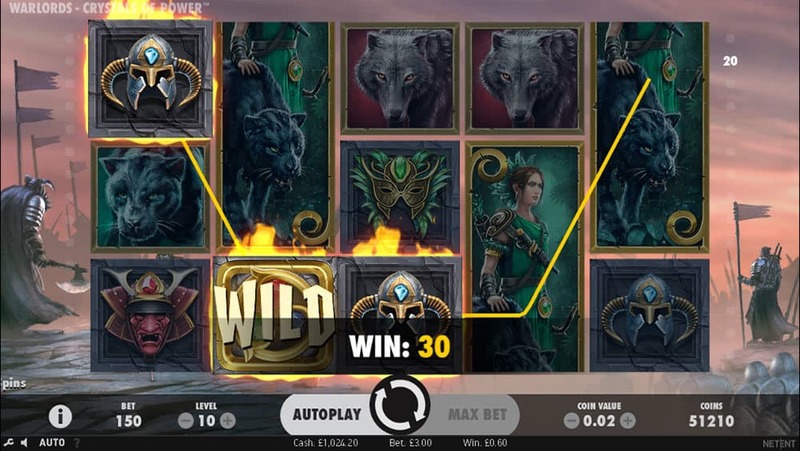 NetEnt aims to blow us away with the superb visuals and game design featured in the Warlords: Crystals of Power online slot. These feats it achieves easily, but they are backed up by the sheer lucrative possibility we can haul from these fields of battle. 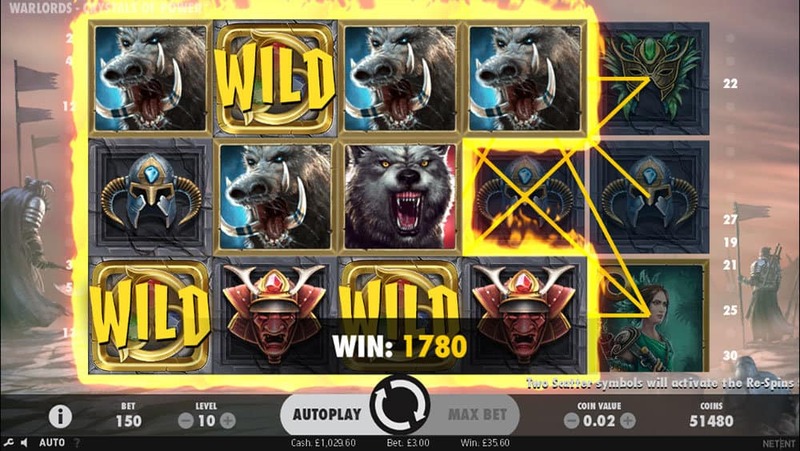 The volatility of this slot matches the theme, with potentially unlimited free spins coming from the Barbarian Free Spins and the Priestess tempting us with an incredible 6,666 times our stake. Now that’s one tasty carrot to dangle. And we’re happy to take a bite, battlefields or not.